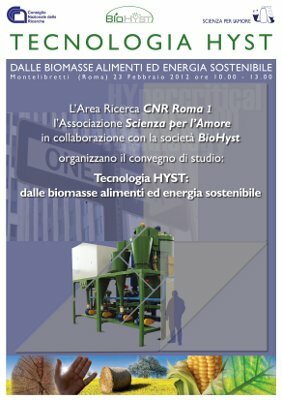 On 23 February 2012, the Montelibretti premises of the Italian National Research Council hosted the study conference on “HYST Technology: Food and Sustainable Energy from Biomass” organised by CNR Research Area RM1 and the Scienza per Amore Association with the collaboration of BioHyst. HYST technology (Patent Application WO 2011/061595A1) is a system for treating biomass which, through a purely physical action, breaks down plant structures via multiple high speed collisions between fragments of material being processed. It is therefore a simple procedure, at low cost with zero environmental impact; an alternative to common processes which modify matter via chemical and thermochemical procedures. Results achieved so far justify the belief that the HYST system can be a solution for enhancing the use of biomass, among which residues and by-products, in order to harmonize food and energy needs. Using the same biomass for more than one purpose is the turning point of this project: a resource for food, energy, chemical and pharmaceutical industries. HYST technology stems from a humanitarian project, today called Bits of Future: food for all, promoted by the Scienza per Amore Association. The aim of this project is to sustain growth in Developing Countries by optimising, through HYST, the use of local resources to fight hunger, poverty and energy shortages. Within this context, this Conference intends to represent an opportunity for encounter and discussion between researchers, socioeconomic reality and industry, in order to analyse the results achieved and trace out new routes for research and development.